The static are at the stationary position of the motor while the dynamic are under running conditions of the motor. This gives relationships between electromagnetic torque developed and displacement angle from steady state position. These characteristics are shown in the Fig. 11. The holding torque of the stepper motor increases with the exciting current. 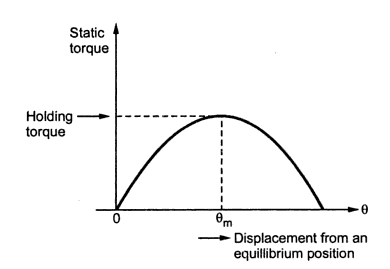 The relationship between the holding torque and the current is called as torque-current characteristics. These characteristics are shown in the Fig. 12. The stepping rate selection is very important in proper controlling of the stepper motor. The dynamic characteristics gives the information regarding torque stepping rate. 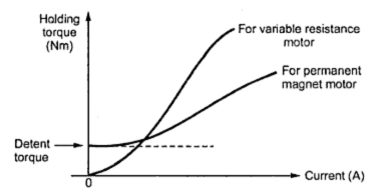 These are also called torque stepping rate curves of the stepper motor. These curves are shown in the Fig.13. When stepping rate increases, rotor gets less time to drive the load from one position to other. If stepping rate is increased beyond certain limit, rotor can not follow the command and starts missing the pulses. Now if the values of load torque and stepping rate are such that point of operation lies to the left of curve I, then motor can start and synchronize without missing a pulse. For example, for a load torque of T'L, the stepping rate selection should be less than f1 so that motor can start and synchronize, without missing a step. But the interesting thing is that once motor has started and synchronized, then stepping rate can be increased e.g. upto f2 for the above example. Such as increase in stepping rate from f1 to f2 s without missing a step and without missing the synchronism. But beyond f2, if stepping rate is increased, motor will loose its synchronism. So point A as shown in the Fig. 13 indicates the maximum starting stepping rate or maximum starting frequency. It is defined as the maximum stepping rate with which unloaded motor can start or stop without loosing a single step. 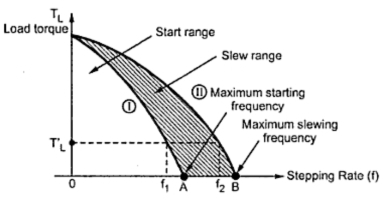 While point B as shown in the Fig.13 indicates the maximum slewing frequency. It is defined as the maximum stepping rate which unloaded motor continues to run without missing a step. Thus area between the curves I and II shown hatched indicates, for various torque values, the range of stepping rate which the motor can follow without missing a step, provided that the motor is started and synchronized. This area of operation of the stepper motor is called slew range. The motor is said to be operating in slewing mode. It is important that in a slew range the stepper motor can not be started, stopped or reversed without losing steps. Thus slew range is important for speed control application. In position control, to get the exact position the motor may be required to be stopped or reversed. But is not possible in a slew range. Hence slew range is not useful for position control applications. To achieve the operation of the motor in the slew range motor must be accelerated carefully using lower pulse rate. Similarly to stop or reverse the motor without loosing acceleration and deceleration of the stepper motor, without loosing any step is called ramping. It is defined as the maximum static torque that can be applied to the shaft of an excited motor without causing a continuous rotation. It is defined as the maximum static torque that can be applied to the shaft of an unexcited motor without causing a continuous rotation. Under this torque the rotor comes back to the normal rest position even if excitation ceases. Such positions of the rotor are referred as the detent positions. It is defined as the angular displacement of the rotor response to each input pulse. It is defined as the maximum load torque at which rotor does not move when an exciting winding is energized. This is also called pullout torque. It is defined for a given pulsing rate or stepping rate measured in pulses per second, as the maximum load torque at which motor follows the control pulses without missing any step. This is also called pull in torque. It is defined as the maximum rate at which the motor can step without missing Steps. The motor can start, stop or reverse at this rate. It is defined as the maximum rate at which the motor can step unidirectionally. The slewing rate is much higher than the synchronous stepping rate. Motor will not be able to stop or reverse without missing steps at this rate.